Taekwon Do is a fractionated world. On one hand, you have the World Taekwondo Federation (WTF) and on the other there is the International Taekwondo Federation. 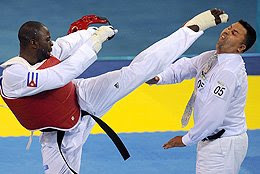 Differences in technique and sparring styles distinguish the two, although, to be honest, taekwondo is still taekwondo. I must admit that I've received weird looks from people when I tell them that I practice taekwondo. There is still this old perception that martial arts are for nutcases and overly-aggressive types. In my experience nothing could be further from the truth. Most TKD organisations are well run, well managed, responsible and actively encourage the participation of children in the sport. Some of the black belts I've met have been the most level-headed, calmest people I've ever met. The variety of taekwondo featured at the Olympics is of the WTF-kind (Boo to that as I'm an ITF practioner myself). Still though, it's great to know that the sport you're passionate about is part of the of the most fantastic sporting event in the world. While I might not like the type of sparring used in the Olympics, I would be optimistic about the Olympics as a platform to promote the sport and get more people involved. However, this year's Olympics was marred by several events. First, we had the overturning of a result in the women's +67 kg event between Sarah Stevenson of Great Britain and China's Chen Zhong. Following an unprecedented use of video footage after the result was declared, the Chinese victory was overturned and the British athlete went through to the next round, which she subsequently lost. The prize for controversy has to go to Cuban 80+kg fighter Angel Matos, who kicked the referee Chakir Chelbat in the mouth following a decision to award the match to the Kazakhstani opponent, Arman Chilmanov. Matos was deemed to have exceeded the one minute injury time permitted to fighters and the bout was awarded to his oponent. Matos and his coach returned to the ring, protesting the decision, resulting in the awful incident shown in the picture above. These events clearly go against both the spirit of taekwondo and the Olympics. It is an honour to represent your country at the highest level in your sport. Watching and reading about these events embarasses me, even though I'll never have the chance to compete at this level. Oh, and by the way, if you're still interested in TKD following all this, check out the Irish National Taekwondo Association based in Exchequer Street, Dublin 2, with many clubs located around the country.